Wales manager Chris Coleman said he was "embarrassed" by his side's "criminal" display in the 6-1 defeat by Serbia. The 2014 World Cup qualifying setback in Novi Sad was Wales' worst since their 7-1 loss to Netherlands in 1996. "We knew it was going to be difficult, but we didn't see this coming," said Coleman. "To say we are disappointed is an understatement and we have to do much better because the goals we conceded were criminal." He added: "We have a mountain to climb because we have not gone into half-time on level terms in any of the four games since I've been in charge." Defeat by Serbia consigned Wales to bottom of the Group A table as their winless run continued following their 2-0 opening defeat by Belgium on Friday. Coleman said he had seen positives in the loss to Belgium despite defender James Collins earning a red card midway through the first half. But what followed against Serbia left Wales' successor to the late Gary Speed "gutted". "I'm embarrassed by the performance, I have to use that word," said Coleman, who won 32 caps as a player for Wales. "When you play for your country, you have to have a bit of bite and you have to be difficult to beat. We've got the players to play football, we know that, but we have to earn the right to do that. "We almost did it Friday until we got a man sent off. Nevertheless we marched on, we pushed Belgium all the way. "But tonight we never earned it. As soon as we went 1-0 down, then we go 2-0, then there's an amazing goal from Gareth Bale. "We're getting to half-time where it's 2-1 and we're right in the game because they started to get a bit nervous. Then we gift them a third goal before half-time, which is unbelievably disappointing and deflating. "In the second-half, we said the next goal will change it - and the next goal went to them. It did change it. It went from bad to worse, unfortunately. "But I accept responsibility. I'm the manager, I've said that. I'm gutted, I'm disappointed, the players are, but what we can't do is accept that performance - and we won't accept it. "To lose 6-1 is an absolute hammering and we can't ignore that." 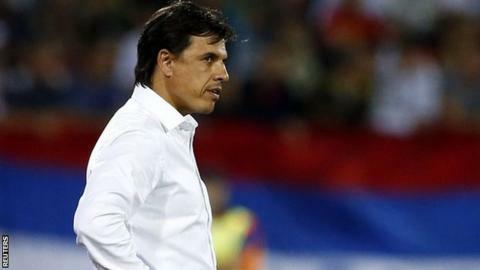 After taking a backseat as Wales lost to Costa Rica in a tribute to Speed, Coleman has presided over three successive 2-0 defeats, by Mexico,Bosnia-Hercegovina and Belgium. Six regulars were missing for the defeat by Belgium, while Collins added to the Welsh woes by getting sent off after only 26 minutes. Of the absentees, who included striker Craig Bellamy, only Joe Allen returned for the trip to Serbia having recovered from illness. In qualifying rounds three and four, Wales face Scotland at Cardiff City Stadium on 12 October and four days later travel to Croatia. Scotland followed up their opening draw against Scotland with another point in a 1-1 finish against Macedonia. Croatia's clash with fellow Group A favourites Belgium also ended 1-1.